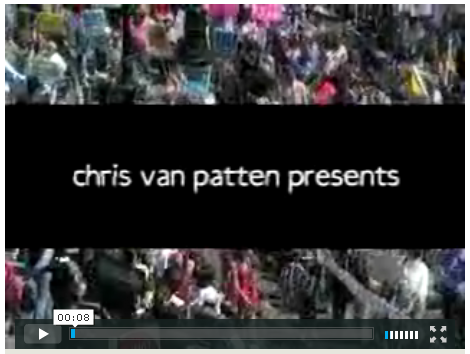 Vimeo have launched version five of their people-driven video sharing tool. The site, owned by Connected Ventures (and through a few levels, IAC), was originally created by Jakob Lodwick as a resource for sharing his short videos with friends and family. The idea grew, but the mission stayed the same – make it easy to share video you create with people you trust. 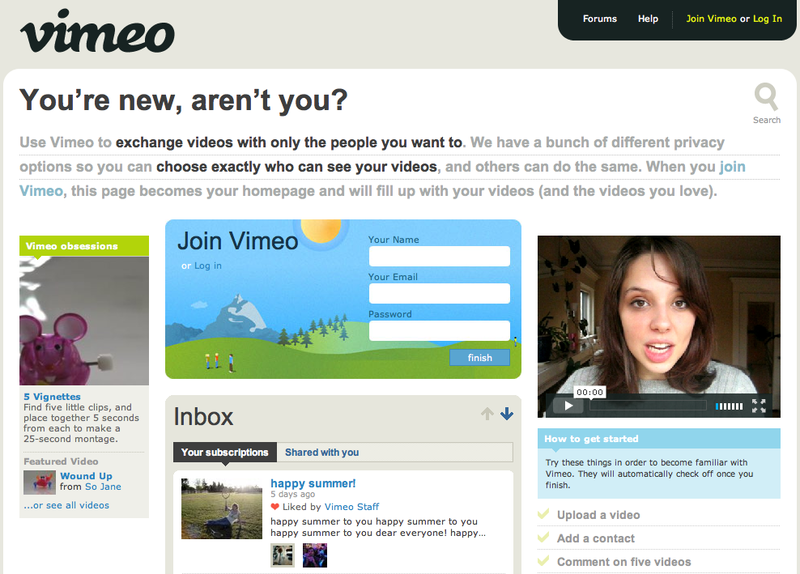 The changes are obvious with the new home page, which distinctly lays out options to register or log in, clips that the Vimeo staff features, stuff that you have brought to Vimeo, and a new area, “Vimeo Obsessions”, an area where, presumably, the Vimeo staff finds the latest trends and links to a short video that fits the trend. I’ve seen the “Five Vignettes” meme and the “LibDub” trend both displayed in the Obsessions area. The video player is new as well, featuring a more boxy and cleaner layout. It feels faster and more intuitive than the previous player, which was sometimes a bit tough to control. The color has also switched away from a red/green to blue, part of Vimeo’s extensive redesign. No stone was left unturned! YouTube is oscillating between the chaos of automatic, popularity-based rankings and the stability of old-school, owner-controlled editorial. Both are lame and you can see the miserable effects of either in every media outlet that exists today. I would bet everything I own on a third alternative: user-controlled editorial. Lodwick’s point is confidently prescient, but it makes sense. We are in an era of user generated content – who is to say that the users cannot decide what content is showcased? Vimeo is making efforts to ensure that the community defines the community; they do not want this to be another stop on the marketing tour. Everything about the site puts the community at the forefront, even the ads are Amazon affiliate ads specially designed by Vimeo to fit nicely into the interface. Will this new release be enough to convince YouTube users to make the switch? Time will tell, but I think initial prospects are incredibly promising. Vimeo not only has a great product, but a visionary path (unique in this world of a million YouTubes, Google Videos, Metacafes, etc.). Hopefully this vision can carry it to success. Last week, I wrote about the proliferation of live content on the internet. Today I’m going to start a short (and open-ended) series describing a few of the new applications and websites that will help you broadcast to the world over the web. Today’s tool is Ustream.tv, a pioneer in easy and fast live streaming. Ustream.tv is a free service for streaming webcam footage live to the internet. Ustream.tv offers a Java chat window on each “channel” (IRC on the backend, allowing for nearly boundless customisation). Used by Chris Pirillo, Zooomr, Chris Dodd, and Leo LaPorte. Ustream is probably the first live streaming site to hit critical mass after the rebirth of live content (started by Justin.tv). It is incredibly simple to use and delivers instant streaming results, although I have experienced some small stream issues (likely due to scaling). 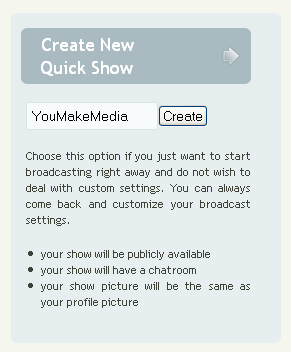 This will create your show with default information and a title that you set. You can change all the complexities later such as a schedule (if you decide to have one), password/chatbox details, etc. Streaming content is sort of the anti-thesis of YouTube (or at least what YouTube has become): Ustream, by its very nature, has to be user-generated. It provides the ultimate forum for webcam confessionals, amateur (and professional) radio hosts, and it is all totally original. From this aspect, Ustream and its competitors are going to provide an interesting breath of fresh air for online video.